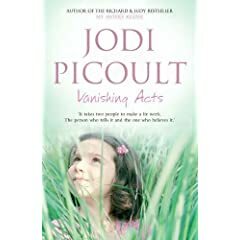 I know that Jodi Picoult has legions of fans who will disagree with me on this, mayhap violently, but I'm going to say it anyway: I really don't see what's supposed to be so great about her books. Vanishing Acts was just kind of spectacularly okay. Is particular novel an outlier? Are other books fantastic? You tell me. Vanishing Acts opens with Delia, the protagonist, finding a small child as part of her job as a search-and-rescue operation. She has a four-year-old daughter, Sophie, with her (recovering) alcoholic lawyer financé, Eric. She and Eric still spend time with their mutual best friend, Fritz. Delia also spends a lot of time with her father, Andrew, a genial widower who stands on Town Council and builds seniors' homes and does magic tricks. Except, of course, his name isn't really Andrew. It's Charles. And her name isn't really Cordelia. It's Bethany. And her mother, it turns out, didn't die in a car crash after all. Andrew/Charles is really Delia/Bethany's father, but she's the victim of a parental kidnapping, taken from her mother in Arizona to New Hampshire as a four-year-old. This all comes out at around page twenty; angst and jail time ensue. Also, there's a recipe and instructions for making crystal meth. And for how to make a gun out of an asthma puffer. Also, there is shanking. You know, it's really a darker story than the cover might lead you to believe (the version I read had this cover). The other big problem, for me, was Delia. Not so much that she's hugely annoying -- she's alright, I guess -- but that everyone else in the novel seems to think she walks on water. Neither Eric nor Fitz can live without her, as they tell the readers what felt like several dozen times. Her father was possessive enough -- perhaps with justification, perhaps not -- to take her to another State and then try to give her the world. The township hearts her because she rescues runaways and little kidnappees with her very smart dog. Overall, there's rather a lot of "Ooh, Delia is sooo amazing"-type telling, with very little showing to account for it. The reader is told over and over that Delia is the light of [whoever]'s life, but she doesn't seem all that special from the way that she acts or thinks. It's a bit irritating and again, it's something that draws my attention to the writing instead of the plot -- that's right, I'm harping on style again -- and as such, it doesn't serve the book very well. That being said, it's not an awful book. Vanishing Acts is an average read, probably well-suited to the beach. I'm in no hurry to read more Picoult after this, but she's not left a bad taste in my mouth either: it's meh reading. Okay, there is actually a reason for this within the story. But it comes so late in the text that it can't make up for the reader's previous impression of stultifying sameness. My objection stands. If you ever read and JoPi again (like, you're stuck in an elevator with Tara Reid and a copy of Nineteen Minutes, so your options are limited), you can pretty well copy and paste this review for it. There are ALWAYS multiple narrators and they ALWAYS sound the same. There is ALWAYS a completely superfluous love story. You will ALWAYS be simultaneously angry and bored. They always sound so good on the back flap, though. I have never read anything by Picoult, and I may be off base for saying this, but I have always suspected that she was a tad overrated. A friend of mine tried to get me to read Her Sister's Keeper, but from her description, the book sounded like really bad melodrama. I am thankful for your honest review and think that I might just stay away from this author. I recently re-read My Sister's Keeper, and while I liked Jodi Picoult about 10 years ago (ostensibly when I had poor taste in books), I could hardly stand her now. I shan't be reading any more books by her. I hate formulaic books. Blech ich retch. I had to laugh when Picoult was quoted as saying, "In terms of the literary content of the 'Twilight' books, they're totally escapist. I think technically I am maybe a cut above,"
Picoult may be a slightly better writer than Meyer, but I don't think that's saying much. I've never been all that interested in reading Picoult. Something about her books have never appealed to me. And just about every review I read - even the good ones - say that her books all pretty much follow the same formula. My verdict: I'll pass. Great review. And you're right - I am new around here, but I won't be for long! I agree, Picoult is, well, I think she's slightly predictable and meh. She was super popular with my 8th grade girls at one point--but even they would discuss how her books all seemed the same. I think I'm going to be in the minority here because I really like her books. But I will admit that Vanishing Acts is probably the worst of the ones I've read. 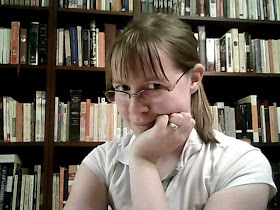 Emma’s latest blog post:She says, cynically. I've read a few Piccoult books and I've been disappointed with everyone one except the first. She has a fill-in-the-blank formula to her books that is so transparent it makes reading more than one a waste of time. However, the only book of hers that I felt was worth the time was My Sisters Keeper. I loved that one. I think Piccoult is famous because her books are good discussion books. She likes to take controversial concepts, like school shootings or suicide pacts or what have you, and show a serious of different perspectives surrounding this event. I love the idea, but as everyone has said, she doesn't do it well. However, even with bad writing, the conversation she can stimulate makes for great book groups. My mom and her group love to read her books, for the stimulating conversation not the stimulating reading. :::Nodding head emphatically::: I've only ever read "Nineteen Minutes," and while I enjoyed it, I didn't feel compelled to run out and read everything else she wrote. Hmmm...I haven't read Picoult. In spite of her popularity (or because of it? ), I've always been a little wary of her books. Thanks for making me feel entirely justified in never jumping on that particular bandwagon! Picoult's books are all very similar, each one just deals with a different issue. The first of hers that I read was 'Plain Truth', which I liked at the time. I've read many others since then, but I haven't been crazy about then (and some I've truly not liked). For some reason, though, I keep reading her books. I won't seek them out, but if they make their way to me, I read them. I read this and thought it was okay. I stopped reading Picoult books because they never measured up to the fantastic My Sister's Keeper. I have read my first two Jodi Picoult novels this week. I started with Plain Truth and found that an easy and pleasant read. Then I read The Pact. The more I read of this the more disappointed I became in the author. It was more or less exactly the same formula as Plain Truth just applied to a different scenario. I was astonished that such a widely read author could be so popular when her writing is just lazy. There were also some parts in the novel when I thought, well that hasn't been well researched and that doesn't ring true. The characters were fairly one dimensional and I think her novels are basically simple summer reads for the beach - and that's not a compliment. I have read a couple of Jodi's books, neither title of which has stuck with me. Mediocrity is the descriptor that comes to mind. No depth in her characters at all. They are painfully one dimensional and her story lines are predictable and tedious. I personally will steer clear of her movies and books in the future. Ugh! I went to a book signing of Picoult in Toronto,Ontario last night and picked up a copy of Plain Truth, not because I liked Picoult, but because she was writing about the Amish and murder and I was curious about it. My friend wanted to go see what a book signing was like and I went with her. Picoult came in surrounded by security (as if anyone would be interested in harming her) She started her talk by stating that she was on the New York's best selling list and had found that she was number 1 in Canada (she was only on the New York's best selling list for My Sisters Keeper and that isn't number 1 any more) It seemed to me that what everyone has written here describes what she is all about. She read three narratives and no story part from the book "House Rules" . The question and answer period seemed to be scripted so that she could talk about her next book and put herself in the limelight. My friend is in the process of being published and e-mailed her and received a response that was anything but negative and a put down. If she hadn't signed the copy of Plain Truth I would return it to the store unread. Not an author that I would wish to read. If you have read my previous review, please understand that I meant that the e-mail that she sent to my friend was all negative and she didn't even thank us for coming out. All questions that were asked seemed to have been scripted and she chose the people that were allowed to ask a question and they seemed to be strategically placed in the crowd. I do not like stuck up and obnoxious authors who think that they are the most important.